Through five full-length films, BS Productions has amassed years of footage featuring hundreds of climbers doing what they do best. It is finally time to open the vaults and reveal the adventures as one seamless film. In Rewind, you will travel back to connect the stories from The Life, The Australia Project, Karma, and Spray with years of never before seen footage. Join us to traverse the lives of Dave Graham, Jason Kehl, Joe Kinder, Emily Harrington, Chris Lindner and many many more in a non-stop stream of action that will flash over 15 years of climbing before your eyes. While it is always nice to see the latest sends of the hardest numbers, I think more “classic” footage of people sending routes “back in the day” is really cool too. Of course, the one trade off in some instances in Rewind is that the camera work is less than spectacular. This is especially true with the footage from The Life that was mainly shot by the climbers themselves. Despite this, it is still cool to see the footage of Dave Graham’s FA of Livin’ Astro (5.14b/c) at Rumney and his FAs of several lesser seen RMNP boulders like Stranger In A Strange Land (V12). 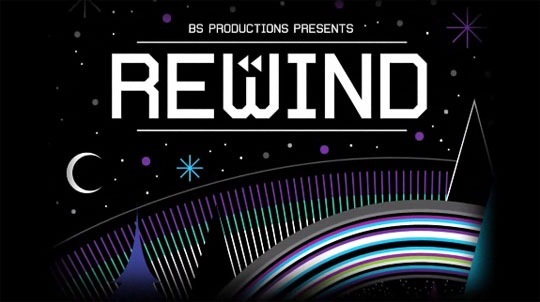 Rewind does include some footage from the 4 previous BS Productions releases, but it also includes a fair amount of unseen old footage. The old footage features somewhat lesser known climbers like Dave Chancellor climbing in SoIll, Chris Sierzant climbing 5.13 barefoot, Harry Robertson crushing The Automator and Brian Capps doing his thing. The movie begins and ends with a teaser for BS Productions’ next release slated to come out later this Spring, The Players. Featuring climbers like Ethan Pringle, Joe Kinder, Chris Lindner, Alex Puccio and Lisa Rands it looks to be worth checking out. More to come on that movie after it’s released. Overall I think Rewind is a great movie to have in your collection if you like climbing movies that have non-stop action. To me one of the most appealing aspects of the movie other than the cool footage is the fact that you can buy it for only $14.99 with shipping included (U.S. only, non-U.S. pays shipping). I’ve long had a hard time justifying spending $30 + shipping on every climbing movie that comes out so I am a big fan of this reduced price point. You can get more information on how to order at the BS Productions blog. In related news, BS Productions has created a channel on Vimeo where they will be sharing various HD trailers and clips. One of the first clips to be addeed is the “lost” footage of Mark Hobson repeating the infamous Zion. Sure enough! I could never really remember where that climb was.